Win A Trip To Comic-Con from Amazon’s LIVE LIKE A PIRATE SWEEPSTAKES! Amazon has a sweepstakes to send the winner and his/her guest to Comic-Con 2013! Details are below! Good luck! If you are an individual legal resident of the 50 United States or the District of Columbia and are the older of 21 years of age or the legal age of majority in your state of residence at the time of entry, you are eligible to enter the Sweepstakes. The Sweepstakes runs through June 29, 2013 and ends at 11:59:59 pm PT. To enter, go to www.amazon.com/gp/socialmedia/promotions/vg-piratesandplunder and “Like” the Amazon Video Games Facebook page or www.amazon.com/gp/socialmedia/promotions/as-piratesandplunder and “Like” the Amazon Student Facebook page if you have not already done so. Click the “Continue to Enter” button to enter using your name and e-mail address associated with your Amazon.com account. If you are not already logged into your Amazon.com account when you click “Continue to Enter”, you will be required to log in to your Amazon.com account to complete the entry process. After entering, you will be taken to an entry confirmation page where you can review your entry information along with instructions for changing your entry information if necessary. One Grand Prize and two Second Prizes will be awarded and are described below. One Kindle Fire HD 8.9″ Tablet (16 GB). One copy of the Assassin’s Creed IV Black Flag Limited Edition video game (signed by members of the Assassin’s Creed IV Black Flag development team). After we confirm the winners, we will post the winners’ names at www.amazon.com/gp/feature.html?ie=UTF8&docId=1001175211 until December 31, 2013. Amazon Services LLC, 8329 W. Sunset Road, Suite 200, Las Vegas, NV 89113. The Sweepstakes is in no way sponsored, endorsed or administered by, or associated with, Facebook. Privacy Notice: All information submitted in connection with this Sweepstakes will be treated in accordance with the Official Rules and Amazon.com’s Privacy Notice (www.amazon.com/privacy). The Hub’s Win a Trip to Comic-Con Sweepstakes! could see them in-person at this year’s San Diego Comic-Con! We’re sending one lucky winner and their guest to the coolest con in the world. Enter for your chance to win a trip for two to Comic-Con! You must be at least age 13 to enter and/or win and all minors must be accompanied by a parent or legal guardian on the trip. NO PURCHASE NECESSARY TO ENTER OR WIN. A PURCHASE WILL NOT INCREASE YOUR CHANCES OF WINNING. Begins at 12:00:00 am ET on 6/1/13; ends at 11:59:59 pm ET on 6/9/13. Open only to legal residents of 1 of the 48 contiguous US and DC who are age 13+. Minors must have consent of parent/guardian to enter and/or participate. Void where prohibited by law. Internet access required. Subject to full OFFICIAL RULES. Odds of winning depend on the number of entries received. Winner must travel on Sponsor-approved dates between 7/17/13 and 7/21/13. ARV of grand prize trip: $4,050. Sponsor: Hub Television Networks, LLC, 2950 N. Hollywood Way, Suite 100, Burbank, CA 91505. Hubworld.com is THE source for kids’ TV shows and the place for kids to play games online. Our games feature fans’ favorite characters from Hub Network shows like My Little Pony Friendship is Magic, Transformers Prime, Strawberry Shortcake, Littlest Pet Shop, and Care Bears Welcome to Care-a-Lot. Hubworld.com has the best free online kids games, plus immersive sites for Hub Network’s kids’ shows and information. Our kids’ videos features full-length episodes of favorite Hub Network shows, plus trailers and sneak peeks of the newest Hub Network shows, special events and more. Hubworld.com is the ultimate destination for kids’ games, kids’ shows, kids’ videos, and more! Bass Pro Shops and Spike TV are sponsoring a “Great Adventure Sweepstakes” where you can win a trip to San Diego for Comic-Con and a fishing excursion on the Malihini! An entire week of fun in sunny San Diego! Plus, round trip airfare and hotel accommodations in San Diego for two (2) for 7 days/6 nights, two (2) passes to attend the year’s largest entertainment and popular art convention and access to Spike’s All Access convention taping! And did we mention you also get a $500 gift card? Ben’s Bargains and Game Rant Present The Superhero-Sized Trip to San Diego Sweepstakes! Ben’s Bargains and Game Rant are giving you a chance to go to Comic-Con 2013! Enter The Superhero-Sized Trip to San Diego Sweepstakes and you and a guest could win a 4 day / 3 night trip to San Diego, passes to Comic-Con, exclusive access to their events and $500 to spend on whatever you want! BensBargains.net’s Win A Superhero-Sized Trip To San Diego Sweepstakes is open only to legal residents of the 50 United States and the District of Columbia over the age of 18 with access to the Internet and a valid email account. Unless specified otherwise, the Sweepstakes entry period begins on May 20, 2013 at 12:00 p.m. (PST) and ends on June 17, 2013 at 12:00 a.m. (PST). When you share the Sweepstakes on social media via PunchTab, your post will be accompanied by a unique URL. You will receive one (1) additional entry into the Sweepstakes for every person that signs up for the Sweepstakes by means of your Referral Link. There is no limit on the number of entries you receive through your Referral Link. Two (2) general admission entry badges to Comic-Con® in San Diego, California, scheduled to take place July 18, 2013 – July 21, 2013. The prize has an approximate retail value of $4,000. Comic-Con® entry badges will be distributed to winner at Comic-Con®. Comic-Con is a registered trademark of San Diego Comic Convention, which is not associated with this promotion. Enter The Big Bang Ultimate Fan Giveaway Sweepstakes to Win a Trip to Comic-Con! In a bold twist to bring The Big Bang Theory to a new frontier, Warner Bros. and CBS Consumer Products are launching an exclusive, limited edition co-branded collection of The Big Bang Theory/Star Trek merchandise for the first-time ever that includes Leonard, Sheldon, Howard and Raj’s preferred version of “Rock, Paper, Scissors, Lizard Spock” themed product, as well as t-shirts and Funko bobble-heads featuring characters in Starfleet uniforms. This new co-branded collection of merchandise will be available only at Hot Topic stores nationwide and HotTopic.com from now until July. Hot Topic will also be the exclusive home to a new, limited edition The Big Bang Theory/DC Comics t-shirt, featuring Leonard, Sheldon, Howard and Raj in their favorite DC Comics Super Hero costumes. In support of these exciting new collections, Warner Bros. Consumer Products and Warner Bros. Domestic Television Distribution have teamed up with Hot Topic to celebrate The Big Bang Theory airing 5 Nights a Week (check http://www.BigBangWeeknights.com for local listings) in off-network syndication. The partnership offers a second annual sweepstakes inviting fans to enter the “Ultimate Fan Giveaway” for an opportunity to attend the biggest pop culture convention in the world – the legendary Comic-Con in San Diego. Fans will also have the chance to win many great prizes, including the special edition DC Comics t-shirt and $500 Hot Topic gift cards. This year’s partnership is offering an even bigger bang with a larger collection of exclusive Big Bang merchandise at Hot Topic locations nationwide. 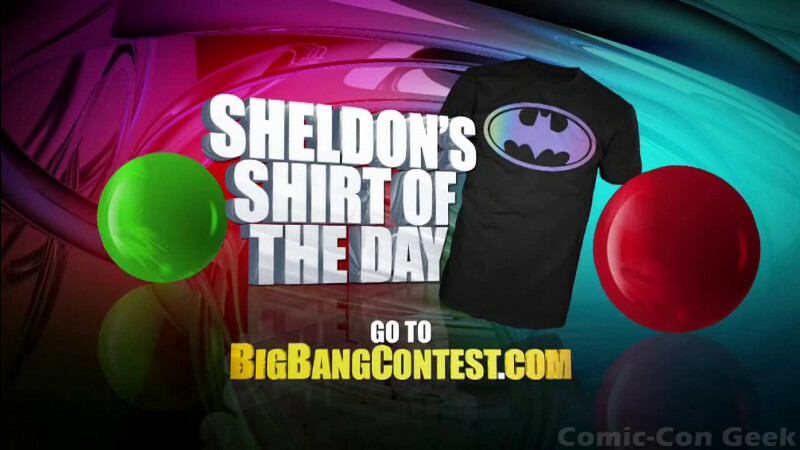 From Monday, May 20, through Friday, May 31, avid fans and pop culture junkies can enter the contest either by watching The Big Bang Theory every weeknight in syndication (in select markets) and identifying Sheldon’s special Hot Topic t-shirt online at http://www.BigBangContest.com or by visiting any Hot Topic store nationwide now through Sunday, June 2, signing up to be a HT+1 rewards member and purchasing any The Big Bang Theory t-shirt, including the exclusive “Big Bang DC Comics” Comic-Con edition t-shirt only at Hot Topic. One lucky fan will receive an all-expenses paid, fun-filled getaway for two to Comic-Con in San Diego, CA – including two tickets to Comic-Con, round-trip airfare, three days/two nights hotel accommodations, ground transportation and special access to various events at the Warner Bros. booth. As part of the promotion, Hot Topic stores will also feature an exciting array of merchandise from The Big Bang Theory spanning apparel, accessories, gift and novelties, and toys, including Funko bobbleheads of fan-favorites Leonard, Sheldon and Howard in Starfleet uniforms. 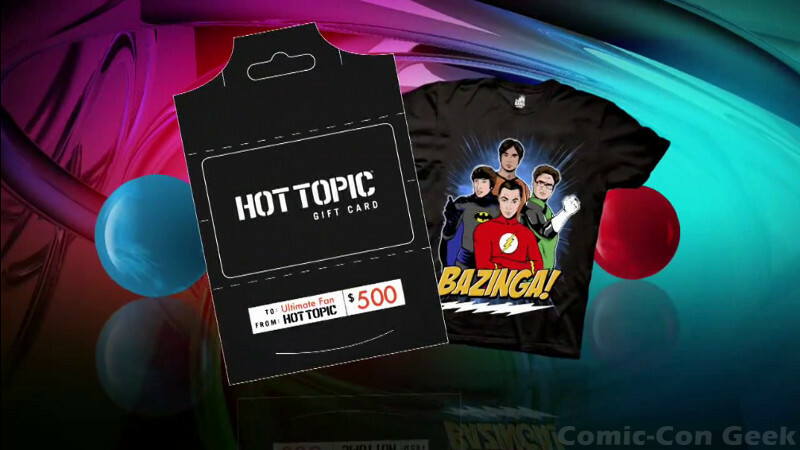 The more viewers tune in to The Big Bang Theory 5 Nights a Week on broadcast television (check http://www.BigBangWeeknights.com for local listings) and go to a Hot Topic retail store, the more chances they have to win. Created by Chuck Lorre (Two and a Half Men) and Bill Prady (Dharma & Greg), who also serve as executive producers along with showrunner Steven Molaro (The Class), The Big Bang Theory stars Emmy® and Golden Globe nominee Johnny Galecki (Roseanne), Emmy® and Golden Globe winner Jim Parsons (The Muppet Movie), Kaley Cuoco (Hop), Simon Helberg (A Serious Man), Kunal Nayyar (Ice Age: Continental Drift), Mayim Bialik (Blossom) and Melissa Rauch (True Blood). The Emmy®-nominated series is from Chuck Lorre Productions, Inc. in association with Warner Bros. Television. THE BIG BANG THEORY and all related characters and elements are trademarks of and ©Warner Bros. Entertainment Inc.
With an over 45-year history and more than 700 hours of content from six television series and twelve movies, Star Trek is an entertainment and pop culture icon across the world. With its visionary philosophy and thrill for adventure, the Star Trek universe only continues to broaden into new territories. Star Trek is licensed by CBS Consumer Products. ™ & ©2013 CBS Studios Inc. STAR TREK and related marks are trademarks of CBS Studios Inc. All Rights Reserved. Hot Topic is a mall- and web-based specialty retailer beloved by rebellious and expressive teens for more than 20 years. Hot Topic offers music and pop culture junkies band-related apparel and accessories, licensed merchandise, and fashion apparel and accessories. Hot Topic operates 621 stores in the U.S., Canada and Puerto Rico and an online store at hottopic.com. Find Hot Topic on Twitter (twitter.com/hottopic), Facebook (facebook.com/hottopic), YouTube (youtube.com/hottopic) and Instagram (instagram.com/hottopic). CBS Consumer Products manages worldwide licensing and merchandising for a diverse slate of television brands and series from CBS, CBS Television Studios and CBS Television Distribution, as well as from the company’s extensive library of titles, Showtime and CBS Films. Additionally, the group oversees online sales of programming merchandise. For more information, visit http://www.cbsconsumerproducts.com. KUSI’s THE BIG BANG THEORY Code-Word-of-the-Day Comic-Con Contest! Another The Big Bang Theory Contest to win passes to this year’s Comic-Con? This one from KUSI News at Six has started last week and is unknown when it ends… (UPDATE: May 23rd) Hopefully, they posted the end date on their Facebook page. Good luck! Watch the KUSI News at Six and the Big Bang Theory from 7-8pm weeknights, and you could win tickets to Comic-Con International 2013! Tune in to the KUSI News at Six and listen for The Big Bang Theory “Code Word of the Day” beginning Monday, May 13th. When you hear the Code Word, return to this page, click the “Enter” tab above, and enter the Code Word along with the requested information. After entering, you’ll receive a 4-digit code. We’ll pick one correct entry at random and announce that person’s name sometime during The Big Bang Theory between 7-8pm. If you see your name, you’ll have five minutes to send an email to contests@kusi.com with the correct 4-digit code (emails MUST be sent from the email address used at time of entry) and you’ll win two tickets to Comic-Con International 2013! One entry per person, per day. Multiple entries will not be accepted. Good luck! One Day Left to Enter Torrey Pines (La Jolla) Rotary Foundation’s Raffle for Passes to Comic-Con 2013! Torrey Pines (La Jolla) Rotary Foundation has two passes to Comic-Con 2013 Preview Night on July 17 and two 4-day passes for Comic-Con 2013 on July 18–21…and they can all be yours if you are the lucky winner of our fundraising raffle. Raffle tickets are $10 each. Only 6,500 raffle tickets will be sold, and we expect them to sell out quickly. To purchase raffle tickets, print out the Raffle Ticket Order Form and FAX or mail it, along with your check or credit card information, to the FAX # or address shown on the Order Form. Please note: All raffle ticket sales are final. Please do not use the Online Donation button below to purchase raffle tickets. By law, online raffle ticket sales cannot be accepted; any funds received other than by FAX or mail will be considered contributions to our Foundation. Your cancelled check/credit card charge will be your receipt. Raffle ticket sales end on March 5, 2013 or when tickets are sold out, whichever comes first. Drawing will be held on March 13, 2013 at the Torrey Pines Rotary Club meeting; the winner will be notified in writing, and the names and contact information for the pass holders will be due at that time. Comic-Con passes are not saleable or transferrable. Passes will be available and sent via Fed Ex (or comparable carrier) in May 2013 upon personalization by Comic-Con. Thank you for your support of the Torrey Pines (La Jolla) Rotary Foundation! Funds raised will be used to continue and expand our many local and international service projects, including funding arts and education needs. A partial list of current projects is below. Please help us continue our good work around the world, and take a chance at having yourself the time of your life at Comic-Con 2013!